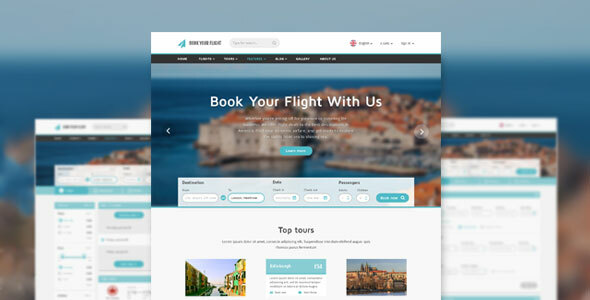 Book Your Flight is an online booking PSD template based on 12 color grid. It is ideal for travel agencies, booking portals, guest houses, hotels, trips and any travel booking websites. We packed this template with common reusable elements and widgets, so it would suit for any business with slight customizations. All layers are organized property, so it won’t take long time to find the necessary one. File structure is fully organized to make the editing process more easy for end-users. Download folder contains 14 layered PSD files (and 4 bonus pages). Book Your Flight Template is designed retina-ready and based on 1200 grid system. Book Your Flight is easy for customizing, highly flexible template that approaches for professional and personal use. It is ideal for promotion services of your company. The clean and minimal design is perfect for any type of travel booking website. What is Sitemap.xml? Why Sitemap is Important for WordPress Website? How to Increase the Speed of Your Website?